I’m pleased to report that 50 Jewish Messiahs, published by Gefen Publishing House, Jerusalem, has recently gone into its second printing. In addition the book is now available in Kindle format at Amazon.com. The book continues to be very enthusiastically received by general readers, as well as having become a part of many community, academic, and Jewish library collections. 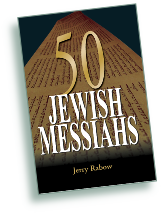 If you haven’t yet had a chance to read 50 Jewish Messiahs, I hope you’ll pick up a copy direct from the publisher at www.IsraelBooks.com or at www.Amazon.com. I think you’ll enjoy it. Jews and non-Jews share a crucial theme—the Messiah. But most readers will be surprised to learn that there have been over fifty Jewish Messiahs since Jesus. Many of these Messiahs had substantial followings and played an important role in the general society of their time. Some founded movements that continued, openly or secretly, for several centuries. 50 Jewish Messiahs tells the fascinating stories of these Messiahs, their followers, and their interaction with the Christian, Muslim, and secular worlds in which they lived. The Jewish Messiah story is not merely the collected biographies of the pious, holy, insane, or fraudulent men and women who were followed as the Jewish Messiah of their day. The story is even more than the alternatingly comical, tragic, and often deeply moving history of two thousand years of Jewish followers who have repeatedly hoped against reason and believed against experience. The Jewish Messiah story is also about the popes, emperors, kings, sultans, bishops, and ordinary Christians and Muslims who were caught up in the often-universal turmoil caused by these Jewish Messiahs. Now you can read the fantastic stories of 50 Jewish men and women who have appeared over the past two millennia and were accepted by much of the world as the Messiah.